Members of Iraqi federal forces enter oil fields in Kirkuk, Iraq October 16, 2017. BAGHDAD, Iraq - Iraq’s central government forces launched an advance early on Monday into territory held by Kurds, seizing a swathe of countryside surrounding the oil city of Kirkuk in a bold military response to a Kurdish vote last month on independence. The government said its troops had captured Kirkuk airport, advanced to the city’s gates and taken control of northern Iraq’s oil company from the security forces of the autonomous Kurdish region, known as Peshmerga. Baghdad described the advance as largely unopposed, and called on the Peshmerga to cooperate in keeping the peace. But the Peshmerga said Baghdad would be made to pay “a heavy price” for triggering “war on the Kurdistan people”. Washington called for calm on both sides, seeking to avert an all-out conflict between Baghdad and the Kurds that would open a whole new front in Iraq’s 14-year civil war and potentially draw in regional powers such as Turkey and Iran. A resident inside Kirkuk said members of the ethnic Turkmen community in the city of 1 million people were celebrating, driving in convoys with Iraqi flags and firing shots in the air. Residents feared this could lead to clashes with Kurds. The overnight advance was the most decisive step Baghdad has taken yet to crush the independence bid of the Kurds, who have governed an autonomous part of Iraq since the fall of Saddam Hussein in 2003 and voted on Sept. 25 to secede. Kirkuk, one of the most ethnically and religiously diverse cities in Iraq, is located just outside the autonomous Kurdish zone. Kurds consider it the heart of their homeland and say it was cleansed of Kurds and settled with Arabs under Saddam to secure control of the oil that was the source of Iraq’s wealth. 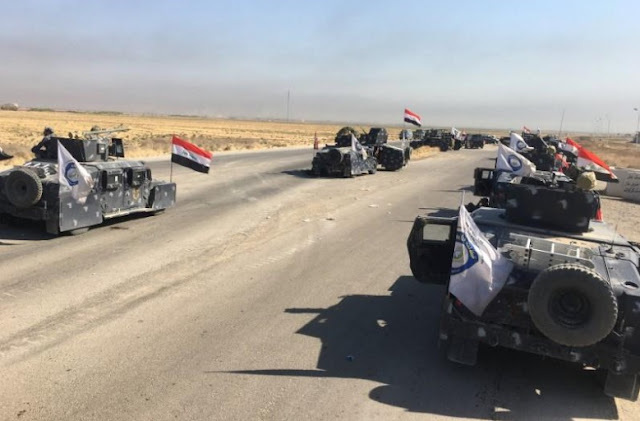 Prime Minister Haidar Abadi ordered security forces “to impose security in Kirkuk in cooperation with the population of the city and the Peshmerga”. “We call on the Peshmerga forces to serve under the federal authority as part of the Iraqi armed forces,” he said in a statement read out on state television. State TV said Iraqi forces had also entered Tuz Khurmato, a flashpoint town where there had been clashes between Kurds and mainly Shi‘ite Muslims of Turkmen ethnicity. The Kurdish regional government did not initially confirm the Iraqi advances, but Rudaw, a major Kurdish TV station, reported that Peshmerga had left positions south of Kirkuk. The “government of Abadi bears the main responsibility for triggering war on the Kurdistan people, and will be made to pay a heavy price”, the Peshmerga command said in a statement, cited by Kurdish leader Masoud Barzani’s assistant Hemin Hawrami. Washington works closely with both the federal forces and the Kurdish Peshmerga to fight against Islamic State. “We call on all parties to immediately cease military action and restore calm while we continue to work with officials from the central and regional governments to reduce tensions and avoid and futher clashes,” the U.S. embassy said. A statement by the U.S.-led international military task force in Iraq described the clashes outside Kirkuk as a “misunderstanding”. Bayan Sami Rahman, the Kurdish regional government’s representative in the United States, tweeted a plea for Washington to “use (its) leadership role to prevent war”. The action in Iraq helped spur a jump in world oil prices on Monday. Baghdad considers last month’s Kurdish independence vote illegal, especially as it was held not just in the autonomous region but outside it, in Kirkuk and other areas the Kurdish Peshmerga occupied after driving out Islamic State fighters. The Kurdish secession bid was strongly opposed by neighbors Iran and Turkey. Washington, allied with the Kurds for decades, had pleaded in vain for them to cancel the vote, arguing that it could lead to regional war and the breakup of Iraq. Abadi’s government has been under strong pressure from Iran-backed militias from Iraq’s Arab Shi‘ite Muslim majority to take military action to crush the Kurdish independence bid. The government said its forces, including the elite U.S.-trained Counter Terrorism Service, had moved almost unopposed into the industrial zone just south of Kirkuk and the oil, gas, facilities located south and west of the city. Iraqi oil industry officials said there was no disruption to production from the facilities of the North Oil Company, which is based in Kirkuk and one of the two main oil companies that together provide nearly all of Iraq’s government revenue. The city of Kirkuk itself remained under Kurdish control, 12 hours after the start of the Iraqi operation, but two routes in and out were under control of the Iraqi forces. “We have no orders to enter the city, just to secure the surroundings,” a military commander involved in the operation told Reuters, adding that the Kurdish forces had pulled out in an orderly manner from the position taken by the Iraqi forces. There were signs of internal conflict among the Kurds, who have been divided for decades into two main factions, the KDP of regional government leader Barzani and the PUK of his longtime rival Jalal Talabani, who served as ceremonial Iraqi President in Baghdad from 2003-2014 and died two weeks ago. Both parties control their own Peshmerga units. While Barzani’s KDP strongly supported the independence referendum, some PUK figures were more circumspect. Monday’s Peshmerga statement cited by Barzani’s assistant accused a faction within the PUK of “treason” for assisting Baghdad’s advance: “We regret that some PUK officials helped in this plot,” it said. Although Iraqi officials portrayed the Kurds as retreating without a fight, Kurdish officials said Peshmerga had clashed with the “Popular Mobilisation”, Shi‘ite forces trained and armed by Iran that operate alongside regular Iraqi troops. The Peshmerga and Popular Mobilisation exchanged artillery fire south of Kirkuk, a Kurdish security official said. The official said the Peshmerga had pushed back two assaults and destroyed several Popular Mobilisation vehicles. Iraq’s central government forces launched an advance early on Monday into territory held by Kurds, seizing a swathe of countryside surrounding the oil city of Kirkuk in a bold military response to a Kurdish vote last month on independence.